Get to know Lil' Bill, a premature calf who weighed just 7.9 pounds when he was born. Moo-ve over, Knickers, the giant cow - or was it a steer? Meet Lil' Bill, a premature calf who weighed just 7.9 pounds when he was born. Bill was brought to the college for advanced medical care because of his small size. He has not been officially confirmed to be the world's smallest cow, but researchers at the Mississippi State University College of Veterinary Medicine suspect that he is. Moo-ve over, Knickers, the giant cow. There's a new viral bovine in town. Meet Lil' Bill, a tiny calf who is roughly the size of a cat, per the Epoch Times. 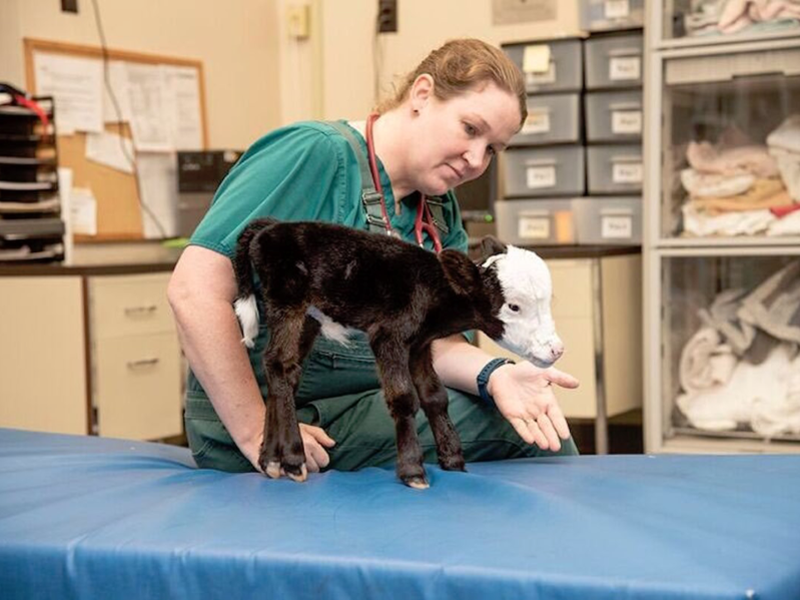 The tiny bull was lives at the Mississippi State University College of Veterinary Medicine, where he's cared for by doctors, researchers, and students. "Occasionally, we get a case that has us scratching our heads a bit. Lil' Bill is one of those cases!" the college wrote on Facebook. "He was born weighing a little over one-tenth of what newborn calves typically weigh." "Is he a mini-cow? Or just unusually small? Super cute," one person commented on the Facebook post. "Precious little thing!" someone else wrote. "Awww, he is pretty darn cute!" a third wrote. In a blog post, researchers at the university elaborated that Bill was born prematurely. Per the post, depending on their breed, calves usually weight between 50 and 80 pounds when they are born. Clocking in at just 7.9 pounds at birth, Lil' Bill "defied the odds by staying alive," per the school's blog. "A cattle producer from outside of the Jackson, Mississippi, area raised Lil' Bill until he was four days old. They contacted the CVM for assistance when Lil' Bill began having some health issues," said Gretchen Grissett, an Assistant Clinical of Professor Food Animal Medicine and Surgery at the University, told INSIDER. Since then, he's been under the care of Grissett and her team. After arriving at the university, the bull's condition improved, Grissett told INSIDER. He no longer needs a feeding tube or therapeutic oxygen, Grissett explained in the university blog post. He does have splints on his legs, as his bones aren't fully developed yet, the blog noted. Grissett told INSIDER that cows typically live in captivity into their teens - and she expects that Lil' Bill could live that long. "I don't see any reason why Lil' Bill can't have a normal life expectancy as long as he can overcome all of his setbacks with prematurity," Grissett said. "He certainly still has many hurdles to overcome before we will know for sure." Grissett said she and her team are waiting on test results to confirm their suspicion that he could also have a form of dwarfism. While they suspect that he is the world's smallest cow, nothing has been officially confirmed. But all things considered? Lil' Bill is doing well! "He spends most of his time being cared for by our outstanding staff, faculty, and students," Grissett said. "He has a really sweet disposition. He enjoys walking around and begging for more milk." If that's not a moo-d.